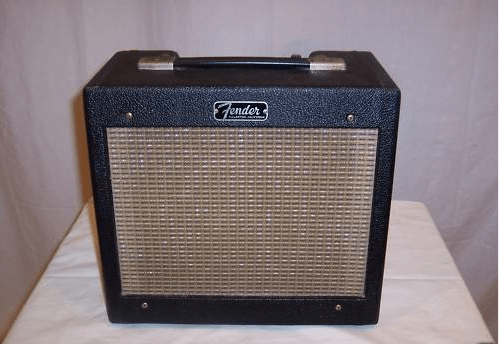 When Fender made the transition from the tweed covering to black Tolex on the Champ in 1964, they also changed the orientation of the controls from rear facing/top mounted (popular with early lap steel/Hawaiian guitar players who performed sitting down behind their amps) to a front facing control layout popularized by players who liked to show off their state of the art Stratocasters by standing in front of their amps. This front facing design also allowed players to move amps to the rear of the stage, creating more room on stage to ROCK! What Fender neglected though (most likely due to the notoriously poor records that were kept), was a nice pile of rear facing/top mounted control cabinets that someone found in a warehouse. Rather than wasting money by throwing away the old style cabinets (which of course would be an instant loss of dollars) Leo decided to use the new style black Tolex on the old style tweed cabinet and sell them. The result? A transition model Fender Champ. A great example is shown below. It is serial number C 22845 which points to the end of 1964 as a manufacture date. The tube chart code is NH which means it was made in August of 1964. It recently sold for $952. You can see the later style sparkle grill cloth and tolex, coupled with the earlier style tweed cabinet. Cool stuff and a great little Fender history quirk. I just got a hold of a Transition Champ Serial # 22872. Excellent shape but not as nice cosmetically as your 22845 (a little rust on the control plate and a slightly stained grille cloth). But it plays very nice. Lots of growl without the high volume bite.